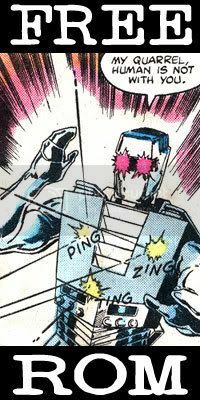 1) Peter Parker is somehow unable to recognize the voice of one of his deadliest foes. Of course, Doctor Octopus could be disguising his voice, but I don't foresee the good Doctor as being adept at such a thing. 2) Mary Jane and Peter haven't lived in California for more than a month. Unless a phone book came out during that time, Doc Ock would not be able to find their number from his squalid hideout. Even if a phone book had come out, the Parkers, with Mary Jane being a rising starlet, would no doubt want their number unlisted. Alternatively, they could be staying at a hotel. The same problem arises, as the hotel clerk would probably not allow people to call through to Mary Jane's room. 3) Doc Ock has a phone and television in his squalid hideout. Being a technical genius, he may have rigged up a way for both items to work without public power and without having to pay the phone company a dime. 4) I'm not sure, but I would think Peter Parker's spider-sense would be going off as this is obviously a trap for Mary Jane. Unless it only works in close proximity to the source of danger, and not over the phone. 5) Peter Parker is not an idiot. Would he honestly believe someone calling him out of the blue for a "photo scoop"? Also, if it's truly a photo scoop, wouldn't such a thing be fairly short-lived and photographed by everyone around so they could post it on YouTube or something? Unless Peter knows it's a trap. 6) Peter is probably going to web-sling to the destination, as he's not one for public transportation. 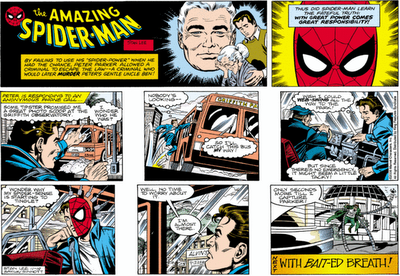 Even when he does take the bus or subway, something happens and he has to don the spider-suit anyway. So what this amounts to is that Spider-Man is going to show up at the location Doc Ock has provided. Hopefully, Doc Ock is just setting this up to make sure Peter is out of the way while Ock kidnaps Mary Jane. So I was wrong, there's only a half-dozen. For God's sake, Doc, that's the second television set you've smashed since this storyline started! I know you're drunk and all revved up to go after Spider-Man again, but you have to show some restraint! Also, are you that dependent on television that you can't wait to steal a new set until after your latest caper? That little "oops" pose you're doing in the last panel does not earn you my sympathy, either. Get your act together, Ock, or you'll never succeed in your schemes. First off, further hoorays for no Jonah's romance. Second, it turns out the west coast isn't really any smarter than the east coast when it comes to discovering secret identities. As the blonde gossip illustrates, they'll pick up on the first part of the puzzle (Mary Jane Parker and Spider-Man come to Hollywood around the same time) and just sort of go an entirely different direction with it. On another note, it looks like the blonde gossip is tearing off her lips. That's creepy. EDIT: It actually looks like she's tearing off her entire mouth. That's even creepier. Dear God. Doctor Octopus is a disheveled mess. What did he do, sit around watching television all night, hoping to see something about Spider-Man? Then again, considering his odd speech pattern and declaration of intent, he was probably out all night drinking. In any case, this strip brings me much joy due to it not involving Jonah's subplot at all. Also, it would appear that people on the west coast are infinitely more intelligent and observant than people on the east coast. In comic time, Spider-Man and Mary Jane haven't been there a month and the media is already picking up on a connection between the two. In any case, you can bet your apples that at some point in the near future Doc Ock is going to kidnap Mary Jane. Today's strip is just a recap of yesterday's strip, done for the benefit of those who don't get the Sunday strips. When my paper did carry the Sunday strips, they seemed to be recaps of the events of the previous week. On a semi-related note, for the past two months or so some newspapers have been packaging in reprints of the classic "Amazing Spider-Man" comic book. Since they are, technically, part of the newspaper should I include brief summaries or reviews of them in this blog? I'm torn on the subject, which is why I'm asking what limited readership I have. Unless, of course, I have no readership, which sort of renders the whole thing moot. Robbie Robertson: "JONAH JAMESON'S IN LOVE??!!!" Well, I'll be! It's Joseph "Robbie" Robertson, probably the closest thing Jonah Jameson has to an actual friend. I'm glad Stan Lee didn't forget about him, and I enjoy his reaction shot to the news that "Jonah Jameson's in Love," with all of its glorious exclamation points and question marks. However, I want to see an end to this subplot as soon as possible. The last thing the world needs is Jonah trying to work his wiles on Maria Lopez. I'm also quite surprised Jonah was able to use his cell phone to call Robbie, as the man earlier showed that he was unable to remove a lens cap in a timely manner. Chances are, he hired a street urchin to dial the number for him. 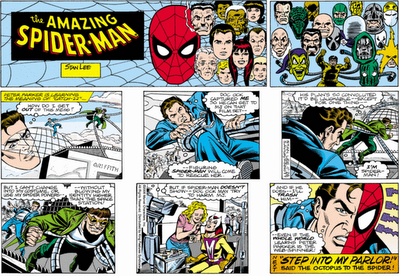 While the third panel brings up disturbing images of yesterday's debacle, the second panel illustrates that Peter Parker wouldn't put anything past Jonah Jameson. Doctor Octopus has to be up to deviltry, but Jameson could be up to anything. Right now he's loitering. I'm not sure how long Jonah has been standing there, but considering how the panel's coloring suggests day, it would seem he's been standing there all night. As a precaution, and so that no others must look at the horror of the middle panel, I have taken the liberty of censoring it. However, you can see the uncensored strip by clicking on the image above. It is quite disturbing, and you can now consider yourself warned. Suffice to say, the doorman's bemused expression with what has happened in today's "Spider-Man" strip does not reflect my feelings on the matter. 1) He is either a bachelor, a widow, or divorced. I know his comic book counterpart is twice married, and the Jameson of the 1994 animated series was widowed when his wife was gunned down by a masked criminal. 2) Jonah is a lecherous scoundrel in the comic strip continuity. The green fellow is my avatar, Mike P, and more of him can be seen here if you wish to. He is doing a sacred duty, protecting you from what lies beneath that comic strip. Jonah is definitely buttering up Maria for something, though I have no idea what. After the first panel, though, the strip sort of peters off into nonsense. It would be a lot less confusing if they weren't so obviously trying to illustrate that Jonah is something. Is Jonah attempting to skip out on the check? Why would he skip out on a check when he's obviously keen on paying? Why, exactly, are Maria Lopez and him out on the town in the first place? I hope we get back to Spider-Man or Doctor Octopus or something soon. JONAH JAMESON, for the love of God, you're at least twice her age and probably married! Stop hitting on her! And you, Maria Lopez, stop acting like you enjoy it! When you first met him you could care less about him. Also, does Jonah have a reputation among old white guys? Otherwise, how would those two in the last panel know anything about him? However, the gray haired chap in the last panel brings up an interesting point. Did you ever see a tigress dining with a shark? More so, did you ever see a tiger fighting a shark? Perhaps a TIGER SHARK? You could call it something like Tiger/Shark, and focus it on a tiger who escapes from a circus or something around the Gulf of Mexico, who ends up fighting a tiger shark in the waters around it. All the while you'd have the rugged man trying to catch the tiger, the attractive co-ed who wants to stop him so the tiger can be returned to the wild, and perhaps someone controlling the tiger sharks with a phermone that would result in the titular clash of animals. 1) I'm pretty sure Jameson is married. 2) Jameson's heart would only get broken. Lopez only has eyes for her cameraman. 3) Jameson is probably like, three times her age. Not much to say about today's Spider-Man. Well, for those not familar with him, Spider-Man is not wearing half a mask here. It's merely artistic license so that we know it's Spider-Man. You know, in case you forgot about him coming in through the window in the first panel, or didn't notice him holding the costume in the third panel. Ah, Spider-Man doing what Spider-Man does best: web-slinging and hunting down dangerous super-criminals. Note that the colorists for the strip neglected to make it actually look like nighttime in the strip. Also note the brief Fantastic Four cameo in the panel where the couple is watching television. In an ideal world, Spider-Man would run into another costumed crusader ever other storyline or so, but I only remember him teaming up with the X-Men's Beast and Namor, the Sub-Mariner. I think the Hulk showed up as well, but I'm not sure. HE'S RETALIATING! HE'S RETALIATING! Wow, I feel so vindicated right now. It's amazing. Somewhere along the way, Doctor Octopus either stole a new television or shoved Jonah's head in a microwave. Because that television set looks a heck of a lot like a microwave. What's more important is that Jonah's words are spurring both the hero and villain into the open, hopefully establishing the scene for another battle between the two with Jonah once again caught in the middle. I mean, come on, he's a news anchor who has a history with Spider-Man and Doctor Octopus. There's no way the station wouldn't send him to the scene of the battle, and no way Jonah would sit idly by while his favorite wall-crawler was battling evil. It also, potentially, opens things up for things such as Peter Parker regaining his job by snapping some photos or Mary Jane's set to be ruined, and everyone going back to New York. Not that the West Coast is a bad thing. As for Peter getting his job back, this is how it usually works: Peter snaps some shots, lords them over Jonah and claims some other paper will pay him handsomely for them. Jonah then welcomes Peter back with open arms, pays him half of what the pictures are worth, and everything's back to normal. Then again, this change of locale may breath new life into the strip. Despite being set on the west coast and having Jonah Jameson as a talking head, this storyline is turning out to be one of the most traditional storylines I've seen in a while. We have Peter Parker fired, Jonah bashing Spider-Man, and a supervillian on the loose. I'll reserve any further judgement on the basis of Doctor Octopus' retaliation, if he does in fact retaliate. 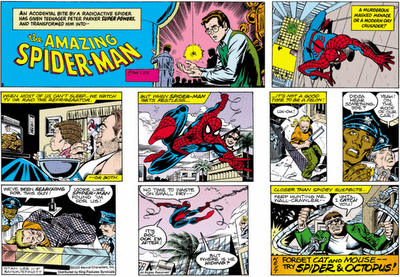 That page should update daily for you, if you want to read "Spider-Man" without my comments. Which is perfectly understandable. EDIT: It was not Blogger preventing me from posting, but Firefox. Jonah Jameson IS A SELL-OUT. Mary Jane brings up a good point. Barring an unforseen circumstances, she will continue to make movie star money. I admire Peter not wanting to be a mooch, but seriously, she's a movie star. Unless he gets into acting as well, anything he gets will be chump change compared to movie star money. The second panel, however, is where this particular strip really grabbed me. How the hell did Jonah Jameson get a co-anchor position within a day? Not only that, but why would he accept it? 1) Jonah has a large metropolitan newspaper to attend to. He does not have time to be a talking head. 2) Jonah has a long-standing rivalry with the television media. At least, as far as I'm aware of. They're the competition. Is Jonah eschewing his journalistic integrity for the relative novelty of being a news anchor? For the moment, it looks like Doctor Octopus has made his way, unimpeded, back to his lair. Could the minor battle between him and Spider-Man broken his spirit? I hope not. Right now, I want Doc Ock to march his way into that TV station and make sure Jonah knows his place: at the Daily Bugle, in New York City. If he could stop by Mary Jane's studio and wreck that, so much the better. Please, Stan Lee, I know you're not reading this but for the love of God, restore to the wall-crawler some of the dignity he once had under your hand. Please? As I said yesterday, Peter can't get fired because he's a freelancer. 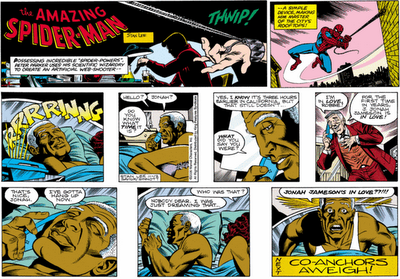 Even then, Jameson fires him on a fairly regular basis. Fighting Doctor Octopus is no excuse, however, as Peter has fought plenty of super-villains and managed to take some pictures of the battles. Also, you might not want to be smashing tables. It could only lead to trouble. You could be labeled as abusive, psychotic, or drunk. Not to mention that it could reveal that you have the proportionate strength of a spider. Ah, wait, I see where this is going. Peter is going to go off and find Doc Ock, beat him up and take some pictures, and "get his job" at the Daily Bugle back. Or, he'll just whine and pout for several days about losing the job.